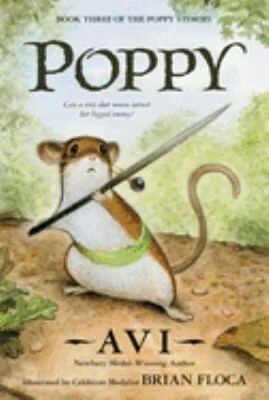 Poppy is a children’s book, similar to other animal-related stories like Mrs. Frisby and the Rats of NIMH and the Redwall series, but aimed at a slightly younger audience. I think I was in third grade the first time I read it and I was instantly captivated – so captivated that I read the book about 10 times. Avi really knows how to get his readers inside the head of a very brave young mouse. Poppy and her boyfriend Ragweed are out having a romantic night on a moonlit field. Ragweed, acting rather cocky, takes no heed of Poppy’s warning that there is an owl circling overhead. Eventually the owl dives down and scoops up Ragweed, while Poppy dives to safety. The owl is Mr. Ocax, who proclaims to own Dimwood Forest (where the mice live) and surrounding areas. Poppy, shocked by her boyfriend’s death at the claws of the owl, returns home and says nothing to her parents. The next day, her father says he needs to make a request to move the family of mice to another dwelling by a farmhouse – their population has grown too large. He asks Poppy to travel with him to Mr. Ocax’s lair so they can make the request. Poppy reveals that Ocax just killed her boyfriend, but she obeys her father and goes with him. It is during the meeting at Ocax’s lair that Poppy realizes there is something at the farmhouse that’s frightening to the owl – and of course, he denies the mouse family’s request to move. Poppy decides to expose Ocax for what he is – a coward and a bully – and on that quest, she meets up with a friendly porcupine who helps her not only expose Ocax, but avenge her boyfriend’s death. It’s a great story for children, full of suspense, action, and some humorous characters. Poppy is a heroine we can all admire – she’s definitely not your typical timid mouse! Children’s Book stay in our hearts. I’m just starting to re-read Plot It Yourself, one of the Nero Wolfe books by Rex Stout. I’ve been re-reading a few of the Nero Wolfe books recently, but I’ve been realizing that two elements of the mystery story I’m writing now are… “inspired” by elements in this book, so I’m reading it again. I know I’ve read it at least twice before, but it could easily be more. The stories are very different (Plot It Yourself is about literary plagiarism; my story is about a religious cult), but there are two elements in common. Cool! I like reading books that inspire what I’m writing. I have read “Killer Angels” by Michael Shaara twice. I’m not sure I’ve ever read a book more than twice and generally once is enough. I’ve got too much new stuff I want to cover to re-read much I’ve already covered. Exactly. I used to read books over and over again all the time, but now there are too many books waiting to be read for a first time! “Watership Down,” by Richard Adams. I’ve read it at least once a year since I was eleven, sometimes even turning from the last sentence back to the first. The heroism of the characters and the rich description caught me early and hasn’t let go. I would say that book is definitely worth reading over.